Ana Meremeta. . . 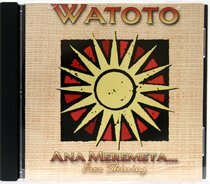 Ever Shining" is one of Watoto's most popular CDs. This CD is a combination of African rhythm, contemporary praise and ethnic dance. Two favorites included on this recording are "Ana Meremeta (Ever Shining)" and "We Are Here" . . . a very special chorus. This recording will touch your heart and allow you to experience the JOY these children have found!